The Hawaiian scenes of Arman Manookian, an Armenian-American painter with a premature and tragic end, have been rediscovered in the last years. The elder of three siblings, he was born Tateos Manookian in Constantinople on May 15, 1904. His father Arshag was a printer and publisher of an Armenian newspaper. Tateos was a student at the St. Gregory the Illuminator school in Constantinople, whose principal was poet Taniel Varoujan. On the fatidic night of April 24, 1915, Varoujan was arrested (he would be killed on the road of exile months later), and Arshag Manookian and his brother-in-law hid in the family’s print shop to save their lives. Young Tateos’ father somehow fled the Ottoman Empire, only to die in France two years later during the epidemic of the Spanish flu. The Armenians of Constantinople lived in an atmosphere of terror until the end of World War I, with arrests, executions, partial exiles, and rumors and threats of general deportation hanging over their heads. The future painter would spend some time in Egypt during those years. His mother managed to sell the print shop and gave a large amount of money to her sixteen-year-old son, allowing him to leave for the United States. Tateos Manookian arrived at Ellis Island in April 1920. 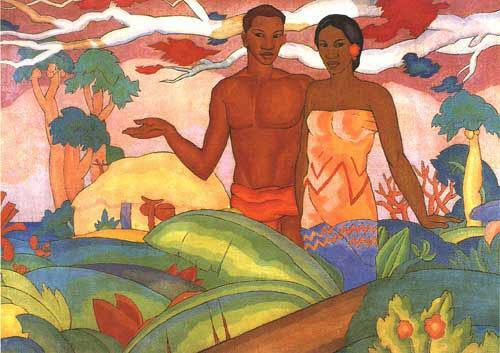 He went to live with a relative of his mother in Providence, where he studied at the Rhode Island College of Design from 1920-1922. His talent was already apparent, as a state scholarship paid for his tuition to take classes in drawing. 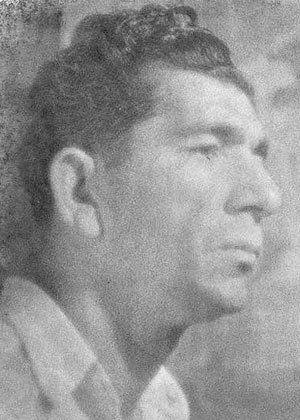 In 1923 he enlisted in the Marine Corps with a new name, Arman Theodore Manookian, and claimed American citizenship, which he actually did not have. In 1924 Private Manookian was assigned as a clerk to Major Edwin North McClellan, a Marine historian, who had worked for the previous five years preparing a history of the Marine Corps during World War I. History of U. S. Marines and Origin of Sea Soldiers, never published (the only extant complete copy is kept at the New York Public Library), would be eventually completed with more than a thousand pages of text and eight hundred pages of notes, and over a hundred illustrations by Manookian, who also started publishing some of his work in magazines. In 1925 McClellan, who was a mentor of sorts during their time together, was dispatched to Pearl Harbor, Hawaii, and took his talented clerk with him. The archipelago fired Manookian’s creativity, who transformed himself from an illustrator into an artist. 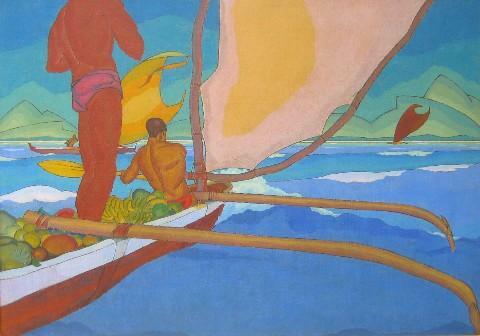 His approach to Hawaiian culture was bound with idealization—“no more intriguing artists’ paradise than these mid-Pacific gardens of the Gods,” he stated in 1927—as shown in the historical and mythological images that he created to accompany McClellan’s pieces. "Men in an Outrigger Canoe Headed for Shore"
After the stock market crash of 1929, the Hawaiian economy declined, with tourism and construction slowing down. Manookian’s workload also went down. In late 1930 he met Cyril Lemmon, a young architect who dabbled in painting. They started working together, and Manookian moved to the home of his new friend, who had recently married. He continued working until the end of his life, but he was emotionally fragile. The years of terror during the genocide and his uprootedness, as well as his separation from his mother and siblings, who had been able to move to Switzerland in the late 1920s, took its toll. On May 10, 1931, while the Lemmons and a few friends were playing the parlor game “Murder,” Arman Manookian drank poison and stumbled in the kitchen, never to regain consciousness. A memorial exhibit for the unfortunate painter was held at the Honolulu Academy in the fall of 1933. Manookian’s works are held in several museums, and only 31 of his oil paintings are known to exist. They have become very valuable in the last few years, with several exhibitions held in Hawaii, where he was acknowledged as “Hawaii’s Van Gogh” in the House of Representatives resolution that recognized the Armenian Genocide.